After the hard-fought victory against the Manchester SW Sabres earlier in the year, both teams knew they would see each other again this season. 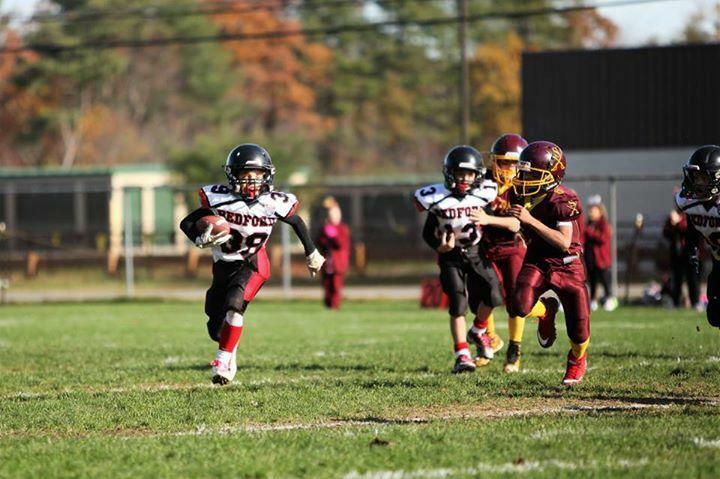 The re-match occurred at the 9U NH State Championship game on a sunny morning at NorRock Stadium. 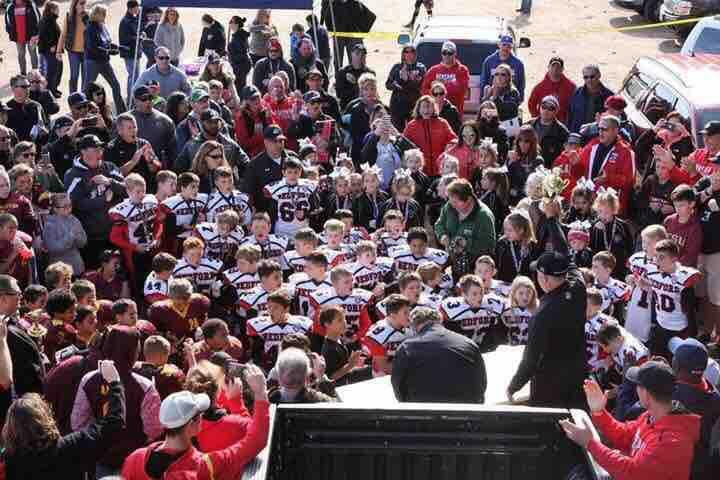 The opportunistic Bulldogs special teams started the game with a fumble recovery and then unveiled their Jumbo offense for the standing room only crowd. On their second play, bruising back James Tamulevich pounded right off the blocks of Josh Meisner, Connor Flaherty, Tyrece Sealey, and Aaron Chmielecki and ripped off a 40 yarder into the end zone. He then added the extra point for an early 7-0 lead. On their first defensive series, the 9U Crew blitzed, causing the Sabres QB to lob a pass that was intercepted by James Tamulevich for a pick-6. The Bulldogs held a 13-0 lead before 2 minutes of the game had elapsed. Fueled by a paleo-diet, it was clear that Tamulevich was high performance and championship-ready. To their credit, the stunned Sabres recovered and turned this into a fantastic first half. Manchester’s star tailback took a pitch right, rolled back the other way and was hit by 9 different Bulldogs before racing for a 70 yard TD. On their next series, a long pass play almost led to another score, but Trenton Otero saved the day with a huge tackle near the goal line. As time elapsed, Bedford held a 13-6 half time lead. In the 3rd quarter the Sabres clawed their way back into the game however with another long TD run that tied things at 13-13. It was a new ball game and it was now time to see if this Bulldogs team indeed had the mettle to “Finish It” … their week-long motto for this game. Bedford proved left no doubt that they did! The Jumbo offense took matters into its own hands, pounded the ball with smash-mouth football right at the heart of the Sabres defense. James Tamulevich and Andre Steinbrueck took turns advancing the ball until Steinbrueck was able to cross the goal line for a TD. Fullback Hunter Crowley (also defensive player of the game) added the very important extra point for a 20-13 lead. Although getting weary, the Bedford’s defense hung tough and got the ball back. It was more of the same for the Canine Committee as they opted to stick with the successful formula and grind it out. Marching down the field in a methodical fashion, the Bulldogs scored another TD as Andre Steinbrueck found a small space left side at the goal line and successfully stretched to hit paydirt. Offensive player of the game James Tamulevich (yes, him again!) scored the extra point and Bedford’s lead swelled to 27-13. In a frantic 4th quarter the Sabres scored another big touchdown and extra point, but their valiant effort eventually fell short and the Bedford Bulldogs grabbed the championship trophy with a 27-20 victory, finishing with a perfect 10-0 season. Undefeated and Undisputed. CONGRATULATIONS to the 2017 9U BEDFORD BULLDOGS. We are very proud of you!